One of the things that I’ve always stated that I love most about Madrid is the fact that it’s a huge melting pot for cultures from all over the globe. Although I enjoy the Spanish cuisine in all of it’s ‘rusticness’ and simplicity it’s really refreshing when you find the places that go outside of that comfort zone and deliver a fusioned style lunch/dinner experience for very reasonable prices. I took a liking to the hints of the French cooking styles, Asian spices and Mediterranean ‘rusticness’ that all go very well together. Most of the times restaurants match their ambiance and decor with the type of clientele and price range they’re in. But what is so great about Ginger is that it gives you the dining room of a slightly more refined restaurant but with prices that are very affordable for young people with a tighter budget. I’m impressed by the way the low prices have not affected the integrity of the food you get on your plate, for example they are extremely inclined to cook steaks and meat to the temperature you prefer. 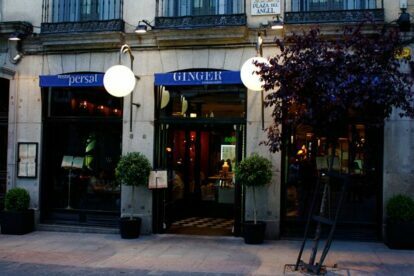 The restaurant is connected to Hostal Persal on Plaza del Ángel just a short walk from Puerta del Sol and right next to Plaza Sta Ana making it a perfect location for any visitor in this fare city.